Core Network or Transport Network indicates the part of a telecommunication network is in charge for transporting user data on a variable geographic scale. Variable in the sense, it including MAN, WAN, international and intercontinental destinations. 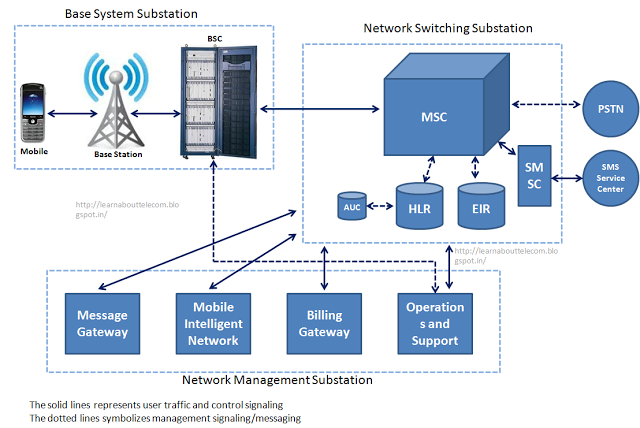 The core network is defined as a set of network elements physically connected, is able to provide the functions of transferring, multiplexing, switching, management, supervision and survival faults for signals transported. The core network interfaces give access to the network which connects end users towards the first central switch. It can therefore be seen as a continuation of the geographical extent of the access network that interconnects between various access networks. In a transport network, the functions prevalent are the aggregation of the next information and the routing of streams multiplexed on common paths through circuit – through switching and packet switching. The aggregation of function for subsequent levels imposes a hierarchical network structure, being able to distinguish between subnets of transport at the metropolitan level, regional, national and international traffic where the volumes and the minimum transport capacity is gradually increasing. This results in a topology : the subnets closer to the access network, i.e. the subnets of metropolitan and regional area, which are characterized by a star structure or much more frequently a ring structure, where the nodes of interconnection between rings are typically are of higher capacity than the other nodes. Regional networks are connected to each other at the national level through a meshed network structure, so-called backbone, characterized by a high volume of traffic flows and traffic matrix complex, they have to allow a full interconnection of regional networks. Example with GSM Core Network. As regards to the method of routing, in the case of transport based on circuit switching, the aggregation of flows is generally use TDM and the protocols of physical layer as PDH and SDH / SONET or optical WDM . The two technologies can also be used in combination to optimize, at the same physical resources, depending on the amount of information carried. In the case of packet switching, using protocols such as Ethernet to higher rates and with appropriate extensions to include features for monitoring and managing the most sophisticated and more responsive to the needs of network operators; mechanisms similar to those of circuit switching or the native IP level (possibly transported on WDM) are applied. This much is more than enough to know regarding Core Network or Transport Network for an advanced user. If you want to know more, its practically better to purchase good books. There are couple of good books covering this topic. Networking, after a level become like philosophy – we basically can not see it ! But this much idea is enough. Tagged With core and transport networks , Core Regional Transport Network , core transport vs backbone transport , What is access and transport network , what is the difference between a tranport and core network? This Article Has Been Shared 5948 Times! Artificial neural network are networks of artificial neurons. Artificial Neural Network is a branch of artificial intelligence research . Remote Procedure Call or RPCn is a technique for implementing inter-process communication, functions are accessed on a different computer than runs the program. Mind Uploading is a hypothetical technology that could allow transfer of contents a brain to a computer, after scanning it and reconstruct it on a computer. Cite this article as: Abhishek Ghosh, "Core Network or Transport Network," in The Customize Windows, August 23, 2013, April 21, 2019, https://thecustomizewindows.com/2013/08/core-network-or-transport-network/.